Foot Locker and Finish Line are in danger of losing market share to Amazon. UBS analysts expect the two to start shutting stores. Foot Locker and Finish Line also have a large presence in malls that have lost anchors Macy's and JC Penney. Retailers across America have been closing stores in droves in 2017 amid years of declines in sales and customer traffic and an increasing threat from Amazon. So far in 2017, retailers have shut down more than 6,300 stores. UBS says sneaker retailers Foot Locker and Finish Line could be the next to start shutting stores. UBS findings come following Friday's dismal second-quarter results from Foot Locker that caused shares to plummet by nearly 30%. The company announced earnings of $0.39 a share on revenue of $1.7 billion, both of which were shy of Wall Street expectations. Additionally, same-store sales sank 6% versus a year ago. Foot Locker shares have plunged 57% over the past three months. "For our part, we will continue to invest in creating compelling experiences for our customers. At the premium end of the market, most of our customers don't want to just buy a specific product they see on a screen. They want that product to have a connection to an experience they find meaningful and want to participate in. That experience could be a special event in a store, being notified of or discovering a video on our website or YouTube channel of an athlete or celebrity wearing or discussing the latest product, an interaction with their friends while touching and feeling the product, or simply a conversation about sneakers with one of our stripers or other store associates. For that reason, we do not believe our vendors selling product directly on Amazon is an imminent threat. There is no indication that any of our vendors intend to sell premium athletic product, $100-plus sneakers that we offer, directly via that sort of distribution channel." However, in a note sent out to clients on Monday, UBS analyst Michael Binetti downgraded both Foot Locker and Finish Line and said that it's "almost certain" that the sneaker retailers will lose market share to Amazon. He lays out three reasons why things are about to get a lot tougher for the industry. First, Binetti sees Nike stepping up its efforts to push sales directly to the consumer. That is especially worrying for Finish Line, which, according to Nike's October 25 Analyst Day, sees 68% of its sales come from Nike. Binetti adds, "For Foot Locker in particular, while many of its stores are among the most compelling retail experiences in our US specialty coverage group, we think the company will have to significantly accelerate closure of its lower tier stores to properly absorb market share shifts to the brands own DTC businesses (and to Amazon)." But the sneaker retailers' problems don't stop there. 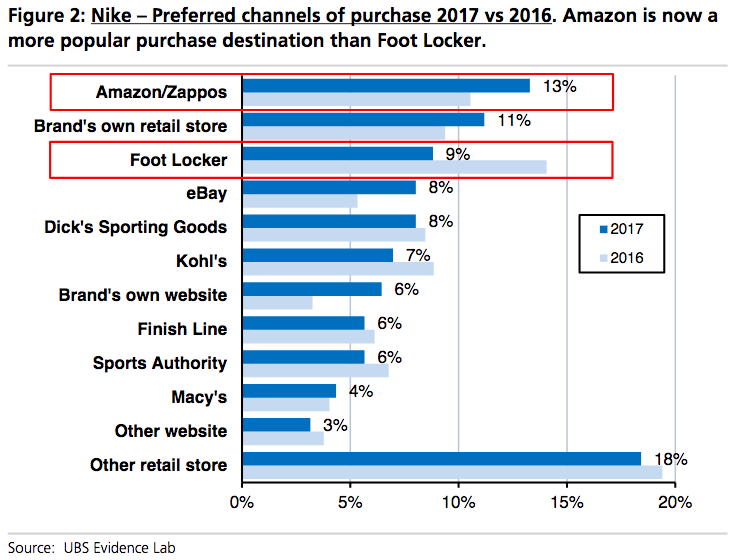 It appears consumers are now choosing to buy their Nikes on Amazon versus going into brick-and-mortar stores like Foot Locker and Finish Line. "UBS Evidence Lab survey shows that in '17 for the 1st time, more consumers prefer to buy Nike on AMZN vs at FL," Binetti wrote. There was a "significant YOY increase in the percent of consumers who prefer to buy Nike product 'on the brand’s own website,'" Binetti notes. "The combination of an accelerating shift of purchase to both Amazon and the brands’ own website—and the subsequent reduction in purchase intent through athletic specialty retailers like Foot Locker—makes it hard to see the path back to accelerating market share gains for Foot Locker." Finally, both Foot Locker and Finish Line have a large presence in malls that have lost anchors Macy's and JC Penney. 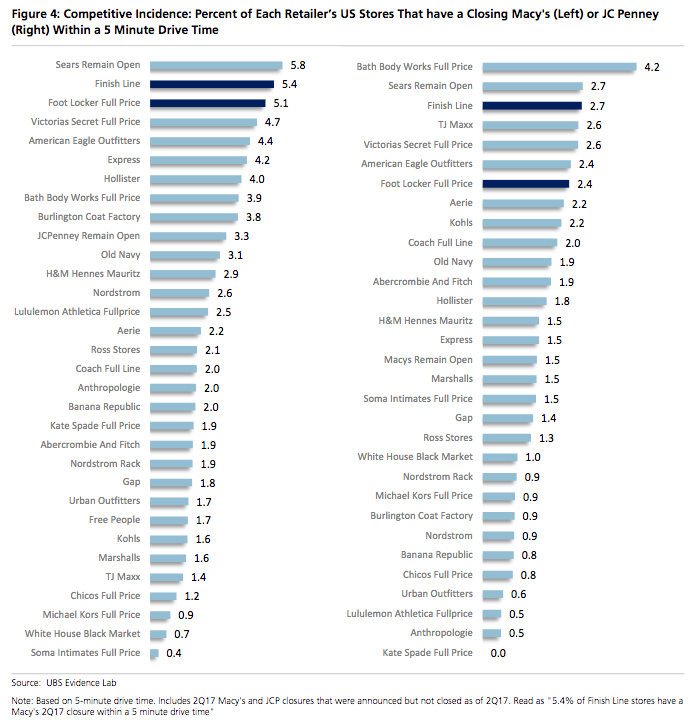 Specifically, Binetti says, "We think FINL is at particular risk (more so than FL anyway) of further deterioration in sales & traffic trends in its stores due to high exposure to lower-tier locations." As a result, UBS downgraded Foot Locker from Buy to Neutral and Finish Line from Neutral to Sell. Maybe Foot Locker's CEO should start worrying.